As we say everywhere else on the site, make sure it is legal to germinate and grow cannabis where you live. This information is for educational purposes only and we do not encourage you to break the law. Setting up a grow room can be a daunting task. In the past you would have to allocate some space and do a lot of DIY work to prepare your space for growing but that has all changed. Grow tents have been designed to replace the typical grow rooms or grow closets. They are specially designed tents which will reflect light, contain smell and provide your plants with an environment to thrive in. They are easy to assemble and the ones we recommend in this guide are well known brands that come with just about everything you need to get started. There is no guesswork. Even for the first time grower how doesn’t have a green thumb you can achieve good results with the right kit. Grow tents come in all different shapes and sizes and different sized tent set-ups will use slightly different equipment. Where to get started can be very daunting, and with all the information “out there” where do you start? The 3 grow tent options we show you below will cover a range of needs and budgets. While the initial set up cost can be quite high, most of what you need to continue growing can be used over and over again. The one time cost is therefore decreasing every time you get a harvest. Ongoing costs are things like bulbs and carbon filters, which will need to be replaced periodically but typically you get 3 or 4 harvests out of them and they are not hugely expensive to replace. The daily running costs are generally relatively low, so there’s no problem of facing a huge electricity bill. The amount of bud you can produce from these tents will have them paying for themselves usually after your first grow definitely after your second. The smallest of the 3 recommended tents uses a 400w bulb and ballast. This equipment is fairly inexpensive to run and can produce large amounts of medicine for one or two people. The higher range grow tent uses a 1000w bulb and these can get quite pricey to run over time so check your energy costs. These recommended tent kits come complete with just about everything you need to get started. The only thing you will need is some feminised seeds, some airpots and your growing medium. A complete 3×3 Grow Tent Package with 400 watt Sealed HPS, Carbon Filter, Fan and other accessories. This is a 3 feet by 3 feet tent and is perfect for beginners, you could easily get 4 decent sized plants in there and have some variety. This is especially important while you are still trying out different strains. With a 400 watt HPS (high pressure sodium) light you are running some decent power to provide your plants with adequate light without any major spikes in your electricity bill. A good place to start if you are looking to begin growing (where legal) and start to experiment with what strain helps reduce your pain. 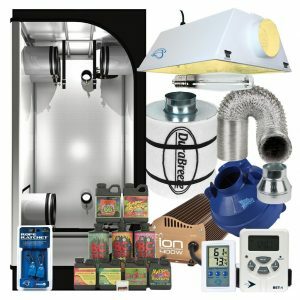 A complete 4 x 4 Grow Tent Package with 600W Sealed HPS HID, Digital Ballast, Filter, Fan and other accessories. 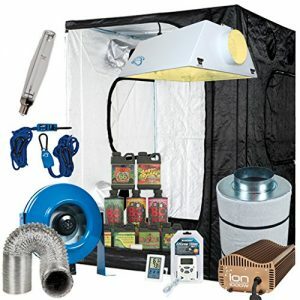 This tent setup is great for those who are looking to produce some larger amounts of meds or a couple with increased needs and personally we think the 600w bulb is probably the sweet spot between energy usage and efficiency. The additional space is also convenient for those who are not very mobile or flexible due to pain from their condition. It makes watering plants and caring for them easier when you have some room to manoeuvre around the tent. 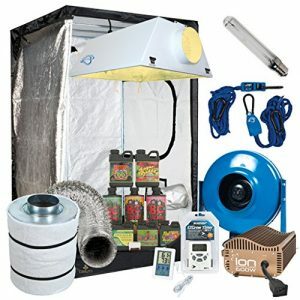 The complete 5 x 5 Grow Tent Package with 1000W Sealed HPS HID, Filter, Fan and accessories. These tent setups are perfect for those who want to either only do one big grow every once in a while and have meds available for a long time, or for those who are acting as a carer for multiple patients. The 1000w light is brilliant for producing quality medicine with much larger yields but that does come at a cost. For an ordinary household you are very likely to notice a fairly steep rise in electricity costs. You will also need some robust ventilation and possibly some filtering depending on your neighbours. 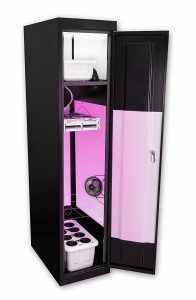 If stealth is one of your biggest considerations when growing your own meds then you may want to consider a self contained grow cabinet. These come in various sizes and are designed to look like a locker or a storage cabinet. Many people have them hidden in plain sight when visitors come around and nobody is any the wiser. The better ones will completely conceal the smell and the noise should be minimal if not inaudible from the outside. They are also very convenient for those who are living in small spaces such as the city and they can produce surprisingly decent yields. 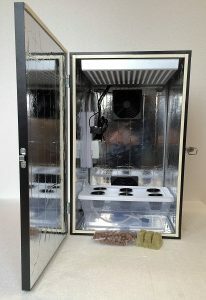 It makes a difference having a grow box that is discreet, out of the way and unobtrusive but they do tend to be on the expensive side. Considering the size and stealth of these cabinets, instead of HPS bulbs, they generally use LED or CFL lights which create a lot less heat and considering the area they need to cover is quite small they tend to do the job just fine. If you just need to get started then this cabinet is ready to grow, it contains everything you need to get going and the running costs are very low. If you have a convenient space then this is going to be just the thing you need, from under stairs cupboard, to laundry room or secure outbuilding. This cabinet is a great way to get growing. This cabinet is a hydro system which can hold up to 6 plants. Considering the space it may be worth growing one large plant instead of 6 small ones but you could easily have a mini SOG (sea of green) setup with 6 small plants. This is a turnkey grow cabinet, simply plug in and get going. It has everything you would need to get started and plants can even be left unattended for extended periods of time. It provides the plants with CO2 which is a nice touch and definitely makes a difference to the overall quality and yield of the final product. There is a bit more flexibility considering the increased size as to how many plants can comfortably fit into it. Another great feature is the cloning station. It’s important to clone plants so that if a particular strain works well for your needs you can keep it indefinitely. This is the one of the best cabinets for extreme stealth. This fireproof cabinet is lockable and as automated as you can get. It literally looks like a locker and has narrow dimensions meaning it can fit into even the snuggest of spaces. 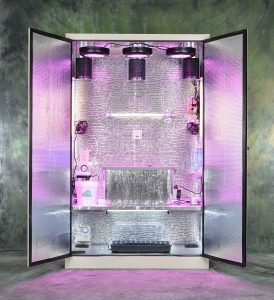 Up to 8 plants can be grown and it also has a separate cloning chamber so that if a particular strain works well for your needs you can keep it indefinitely and helps you maintain your ideal genetics indefinitely. It comes with a steep price tag and you could easily put something like this together much cheaperbut if you are after a great quality stealth cabinet and pure convenience, you probably won’t find much better than this. The quality of the build will ensure that it will last a long time but even if something does go wrong there is a 3 year guarantee. Electricity costs – check with your local provider they usually will have an estimate calculator and please ensure you have the right wiring in your proeprty to support the additional load. Heat – the higher the wattage the more heat problems you may run into and when growing Cannabis excessive heat can stress your plants unnecessarily. You may need to add in intake fan if your temperatures are too high or as a worst case scenario add in a small air conditioning unit. These often aren’t needed but if you live in the desert for example heat will be problematic. Space – What is the space you have to work with, and have you access to electricity as well as working safely. Ventilation – having outside access is key, you want to run the exhaust pipe outside otherwise warm air just re-circulates in your room and increase the ambient temperature. Noise – while the noise is quite an acceptable level and usually sounds like a loud computer fan, it all depends where you are going to put the tent. If you have a spare room or a basement it’s not really a problem. If you plan on keeping it in your bedroom next to your bed it will be a nuisance. Smell – Grow boxes can highly mask any smell or odours from your set up however please do be aware that ventilation pipes can waft smells some distance when the wind rises. Try to make sure you are discreet as not everyone will want to smell your produce. Here are a few safety pointers, if you are concerned ask a professional, we are just providing some guidance as to what may be a problem for you. The good quality tents and cabinets are fire resistant and a fire breaking out is a very unlikely thing to happen but it’s worth bearing in mind that when dealing with electricity there is ALWAYS a fire risk. There will be quite a few electrical appliances running at the same time and it could put a heavy load on the circuit especially if you are using the 1000w light so best practice would be to get an electrician to check that there are no electrical faults, that your circuits are safety tested and are not outdated. Always keep a fire extinguisher handy and install a smoke detector in the grow room.